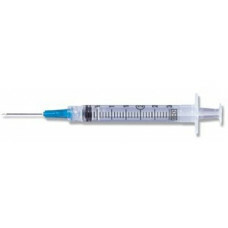 World's sharpest needle is combined with BD's clear barrel featuring bold scale. 3 mL BD Luer-Lok™ syringe with positive plunger rod stop and tapered plunger rod design. Packaging is clearly labeled latex free.